So…not exactly sure how to get this thing started. To say that I’m a fan of the cheeseburger would be an understatement. I LOVE cheeseburgers. Fast food, diner, gourmet…doesn’t matter. I mean, what’s not to like? In fact, if it were up to me, I’d eat several throughout the week. However, I do recognize that this probably wouldn’t be the healthiest diet plan to adopt, and I truly would like to grow old with my beautiful and loving wife. This blog has no deep, meaningful purpose. Just a means for me to document all the mouth-watering creations I consume on my quest to try every cheeseburger I can get my hands on. I wanted to come up with a really clever name for my blog, so after some extensive research (i.e., doing a Google search and finding info on Wikipedia), I ended up with…nothing. Luckily the wife was able to give me some guidance and hence The Burgervore was born. The desire to chronicle my cheeseburger journey developed about a year ago, so my starting posts will be of memorable meals in the past. I’m no food critic and definitely not a wordsmith so I apologize in advance if my descriptions are simple or rudimentary. 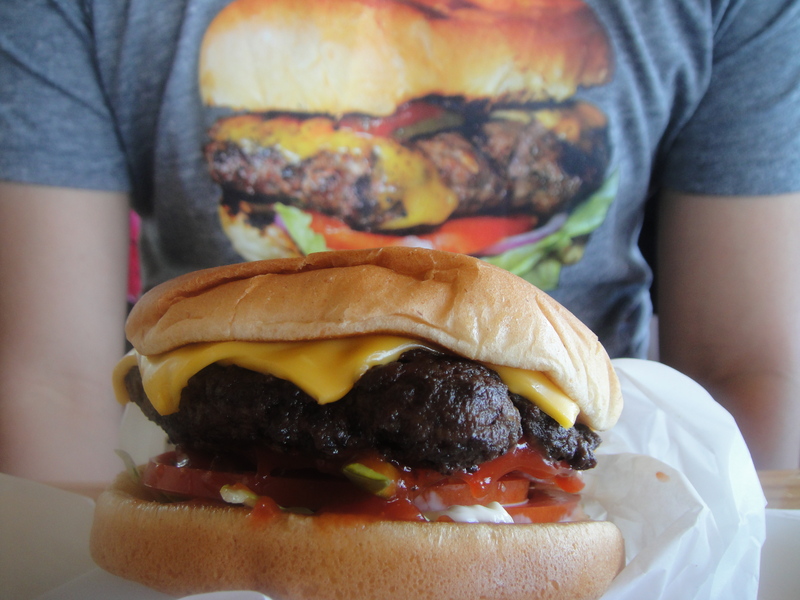 Let’s start with a local burger joint – Mighty Fine Burgers. Mighty Fine uses fresh, all-natural chuck that is ground on-site and hand-formed into patties. I get my 1/2 lb burger with all the veggies (fresh tomatoes, onions, iceberg lettuce, and crinkle dill pickles), American cheese, ketchup and mayo. They don’t offer you many options on their menu, but what they do have, they do well…VERY well. They use Idaho potatoes for their crinkle cut fries, which by the way they cut fresh using their fancy crinkle cut machine. I’ll be honest with you, though – I’m not a big fan of their fries as I find them a little too thin for my liking, but that doesn’t keep me from going back whenever I’ve got a cheeseburger craving. They also make a mean hand-squeezed strawberry lemonade, and their hand-dipped shakes made using Blue Bell ice cream…yum. So smooth and so flavorful. Now this is how a classic Texas cheeseburger is done! They season the meat just right and arrange the toppings perfectly so that you get a little bit of everything in each bite. Until next time…throw another burger on the grill and add some cheese for me!! What’s the best cheeseburger you’ve ever had and where did you get it from? Burgervore, thanks for the great review! Do you have an address you could send me? Thanks for stopping by!! You can reach me at theburgervore@gmail.com if you need to get in touch with me.